Oxygen must never be used near open flames since it supports burning. Oxygen cylinders must be handled carefully since they are potentially lethal missiles if punctured or broken. ARTIFICIAL AIRWAYS The oropharyngeal and nasopharyngeal airways are primarily used to keep the tongue from occluding (closing) the airway. 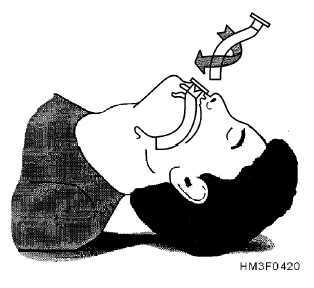 Oropharyngeal Airway The oropharyngeal airway can be used only on unconscious victims because a conscious person will gag on it. This airway comes in various sizes for different age groups and is shaped to rest on the contour of the tongue and extend from the lips to the pharynx. Selecting the correct size oropharyngeal airway is very important to its effectiveness. An airway of proper size will extend from the corner of the patients mouth to the tip of the earlobe on the same side of the patients face. One method of insertion is to depress the tongue with a tongue blade and slide the airway in. Another method is to insert the airway upside down into the victims mouth; then rotate it 180 as it slides into the pharynx (fig. 4-20). Nasopharyngeal Airway The nasopharyngeal airway may be used on conscious victims since it is better tolerated because it generally does not stimulate the gag reflex. Since it is made of flexible material, it is designed to be lubricated and then gently passed up the nostril and down into the pharynx. 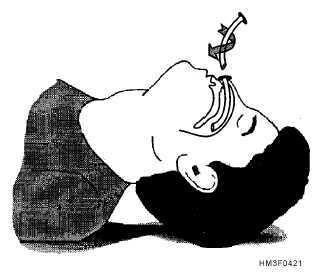 If the airway meets an obstruction in one nostril, withdraw it and try to pass it up the other nostril. See figure 4-21 for proper insertion of the nasopharyngeal airway. BAG-VALVE MASK VENTILATOR The bag-valve mask ventilator (fig. 4-22) is designed to help ventilate an unconscious victim for long periods while delivering high concentrations of oxygen. This system can be useful in extended CPR attempts because, when using external cardiac compressions, the cardiac output is cut to 25 to 30 percent of the normal capacity, and artificial ventilation does not supply enough oxygen through the circulatory system to maintain life for a long period. Various types of bag-valve-mask systems that come in both adult and pediatric sizes are in use in the Navy. Essentially, they consist of a self-filling ventilation bag, an oxygen reservoir, plastic face masks of various sizes, and tubing for connecting to an oxygen supply. 4-26 Figure 4-20.The rotation method of inserting an oropharyngeal airway. Figure 4-21.Proper insertion of a nasopharyngeal airway. Figure 4-22.Bag-valve mask ventilator.